B&W 686 review | What Hi-Fi? Even where B&W loudspeakers are concerned, it seems that appearances can sometimes be deceptive. Take these 686 standmounters, for instance. If they sounded as similar to the company's multi-Award-winning 685 boxes as they look, they'd be offering the sternest of challenges to Award-winners and contenders alike. Instead, they finish with a three-star verdict – that's down a star since we last listened to them back in April this year. There's nothing in the quality of build or finish to suggest the 686s can't live up to the high standards B&W sets itself. These are tidy-looking boxes, neatly finished and tactile – they look and feel as though they're from the next class up when you put them next to Dali's Award-winning Lektor 1s. If the battle was won and lost on the retailer's shelf, this Group Test would be a much closer contest. And, initially, our sonic impressions are just as favourable. Playing The Auteurs' Lenny Valentino, the 686s (which, as a glance at the technical specification shows, are by no means the biggest boxes in the test) generate an unlikely amount of low-frequency extension and presence. 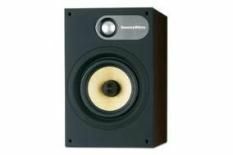 There's the sort of authority and outright scale of presentation on offer that's quite at odds with their modest cabinet dimensions, too, as well as smooth, sweet treble sounds and winningly natural midrange tonality. Like a mouthful of high cocoa-content chocolate, though, the B&Ws' slightly rich overall sonic signature becomes cloying before too long. Alexander ‘Skip' Spence's Broken Heart suffers from the 686s' gibbous low-end – while we admire the clever engineering that liberates this much bass from such a teeny cabinet, we'd definitely trade some of the prodigious extension for greater grip and control, as well as a bit more excitement. Blocking the rear-firing reflex ports with the supplied bungs brings a little more discipline, but at the same time congests the low mid-range – voices once sweet become a little less detailed and expressive. In some categories, a performance such as this would be ample to secure a four-star verdict. Not around here, though; the competition is feral, the standard giddily high.